Helen Macdonald’s (b. 1970) “H” is for Hawk, is a stunning story of the precious minutia of owning and training a goshawk. It’s about post-grief retrenchment and how to reopen a shattered self. I felt odd: overtired, overwrought, unpleasantly like my brain had been removed and my skull stuffed with something like microwaved aluminium foil, dinted, charred and shorting with sparks. In this abstract state, Macdonald, like many in grief, turns to something technical and active to keep her busy and engaged and somewhat normalized. She adopts a goshawk, a lifelong dream. Or rather, she waits patiently while the goshawk adopts her. I must not look the hawk in the eye. I must not punish the hawk, though it bates, and beats and my hand is raw with pecks and my face stings from the blows of its bating wings. Hawks cannot be punished. They would rather die and submit. Patience is my only weapon. Patience. Derived from patior. Meaning to suffer. It is an ordeal. Northern Goshawk. Illustration from the RSPB an organization that educates, advocates and conserves birds throughout the UK. Learn more. To train a hawk you must watch it like a hawk, and so you come to understand its moods. […] You seem to feel what it feels. Notice what it notices. The hawk’s apprehension becomes your own. You are exercising what the poet Keats called your chameleon quality, the ability to ‘tolerate a loss of self and a loss of rationality by trusting in the capacity to recreate oneself in another character or another environment. Turning to animals in times of grief isn’t new. In fact, their abounding love in the most trying times might account for the explosive statistics of pet ownership in the last century. 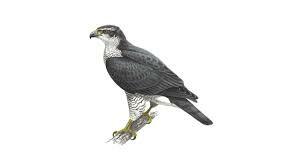 But a goshawk is different, its trust and respect are earned not given. And yet, in that way, this creature does for Macdonald what another creature might not. Elusive, spectacular, utterly at home, the fact of these British goshawks makes me happy. Their existence gives the lie to the thought that the wild is always something untouched by human hearts and hands. The wild can be human work. Adult Goshawk. 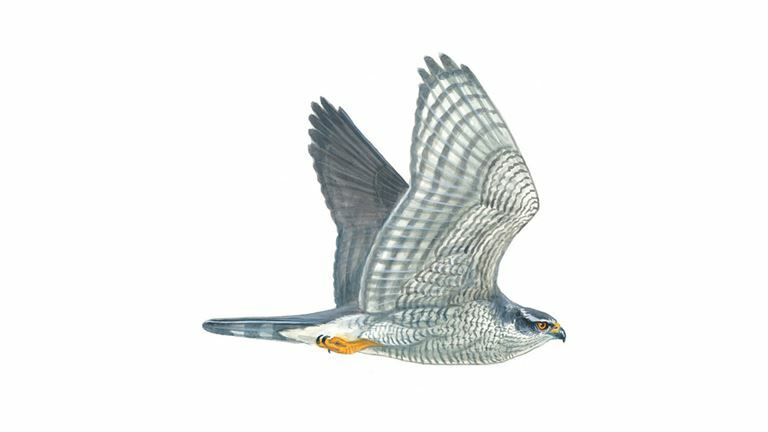 Illustration from the RSPB. When people die, we wonder where they go, where they exist. Soon after, we wonder what to do with all the love, care, attention, conversation and we once poured into their presence, their ears, their souls. Extending her humanity into this new relationship, Macdonald finds a connection and purpose, not to replace her father, but to help replace her active need to love her father. Recent study of the millennia-old habit of pet-keeping tells us that there is a deep aspect of our humanity is ennobled by the love of an animal, and indeed many writers, thinkers and wanderers have been subject to such grace. Accompany MacDonald’s beautiful book with Grief is a Thing With Feathers, a stunningly unique prose poem from English author, Max Porter, about a crow that moves in with a family following the death of their mother and wife.